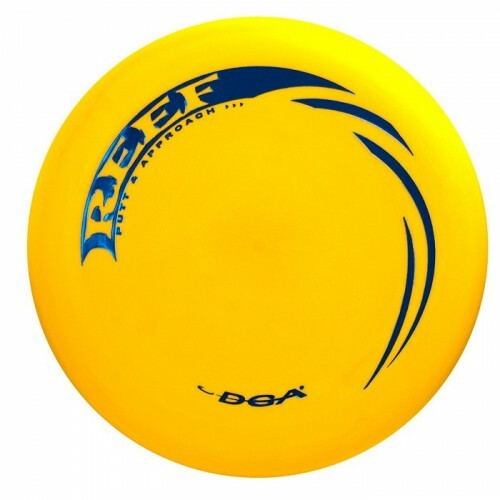 The DGA D Line Reef is a slightly understable putter and approach that evolved from the revolutionary Discraft APX mold. It has a slow, straight flying, controllable flight path with consistent fade. It can keep your putts catching the chains in the most treacherous situations and hit the chains from anywhere on the fairway. It's a disc golf disc for all skill levels. The Reef can hold any line that you put it on when approaching, and is the perfect flip-to-flat putter (flattens out during flight). The Reef in D Line Plastic will have superior grip compared to that of its SP Line counterpart. Features - controllable putt and approach disc, tacky grip, increased glide. Diameter 21.2 cm. Rim Width 0.9 cm. Rim Depth 1.4 cm.